Train passengers who are delayed by more than an hour will be given full refunds by the new company running the Wales and Borders service. 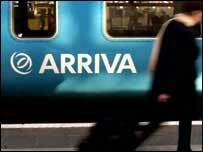 Arriva, which will take over on 7 December, will receive subsidies totalling £1.63bn over the 15 years it holds the contract. The company, which will operate as Arriva Trains Wales/Trenau Arriva Cymru Ltd, has also promised safer and more punctual performance, a more "user-friendly" timetable, and greater integration of trains and buses. The company, which will operate as Arriva Trains Wales/Trenau Arriva Cymru Ltd, will get subsidies of more than £100m for each year after signing a deal with the Strategic Rail Authority on Monday. It means for the first time Wales will have a single rail service run by one management. Arriva chief executive Bob Davies said: "We have established a team based in Cardiff who are working closely with the existing operator to ensure a smooth transition in December. "Over the next couple of months there will be an extensive consultation process regarding our plans to improve the rail service in Wales and the border counties. "This process will involve the Welsh Assembly Government, the Rail Passengers Council and committees, and other stakeholders. "Our focus will be to ensure we deliver a safe railway with improved performance, reliability and punctuality for existing and new customers." Arriva will hold the franchise until 2019. It will operate all stations in Wales, and those largely served by the new franchise in the border counties, including Chester, Shrewsbury and Hereford. Abolition of the £1 reservation charge for bicycles on trains. Richard Bowker, chairman of the Strategic Rail Authority, said there would be a "step change" in train services for Wales. "This has all been achieved through partnership between the Welsh Assembly Government and the SRA, and Arriva Trains will now concentrate on what matters most to passengers - improved performance, reliability and punctuality," said Mr Bowker. Welsh Economic Development and Transport Minister Andrew Davies said: "I am looking forward to working with Arriva to improve the existing service and to develop new passenger services on the Vale of Glamorgan and Ebbw Valley lines."